Move the Oak land up with tower, then play wild to lock the last land, move up on the forest, use the oradrim monk to move on the desert, kill the middle plant (at the time, your oak will die on the second plant at the next opponent turn). aurora trick the 0/2. 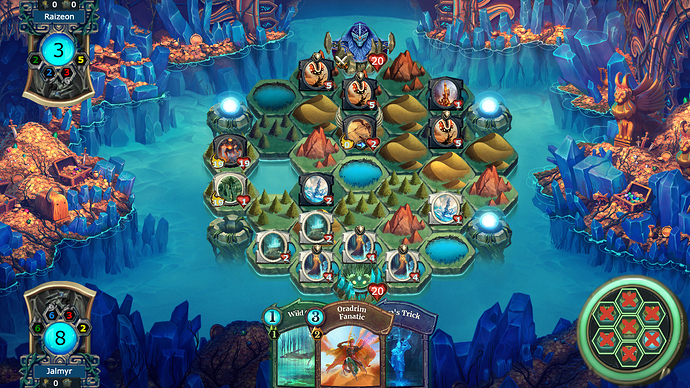 You will use it to block one turn more the 19/19 to hold 6 turn and win to deck. Alternately, you don’t block. You use the Oakfather to kill the middle plant like Mayhem described, but instead of using Trick on the Windstorm Champion, you use it on the Battle Rager and punch that into his face. My solution doesnt work if he go down. I will try find another later. But how do you use trick on a 19/19 ?? i don’t understand that. correct solution,though please mark the solution with spoiler like that . Yes, mixed up Aurora’s Trick and Aurora’s Creation.